Next time I would use pins without fancy balls on all the layers until I got to the top, where they show as these pins are more expensive then flat headed pins. The biggest challenge Angela and I had designing this tree is trying to figure out how we would finish the top, since my cone had a flat top and the strips of ribbon were also flat at the top. After a trip to the store, I found a great 3-D snowflake which was part of a larger ornament at the Dollar tree store which fit the bill, to fill the top space of the tree your top definitely needs to be 3-D. For a finishing touch I used a Snow Writer from Deco Arts to drip snow from the top of the tree to cover the top of the Styrofoam. Next I added a little Crystal Glitter from the Art Glitter Institute for a little bling. Then I added this cute little ornaments I found at Jo- Annes Fabrics between the scraps of paper. 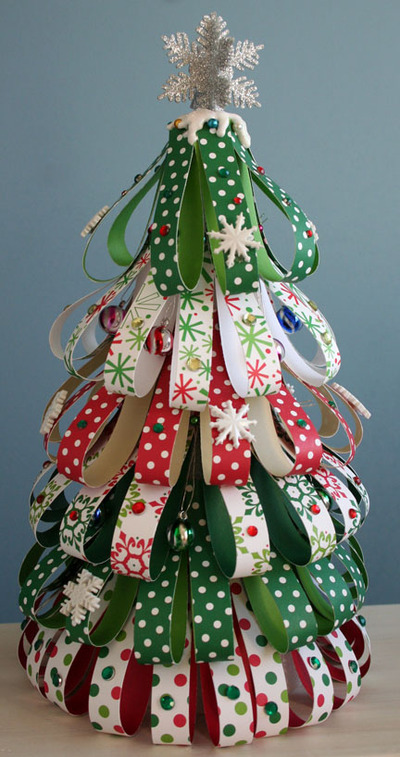 I love buttons, so next I cut off the shanks of my snowflake buttons and began gluing them on the tree. For the finishing touches I added self-adhesive Rhinestones from KaiserCrafts. Now of course this tree just started the wheels of creativity turning and you will have to stop back tomorrow to see the next Christmas Trees Angela and I designed. Wouldn't these be perfect for centerpieces for a Holiday Party or even a Christmas Wedding!! Added Notes: I started with a cone that was 2 7/8" x 7 7/8". 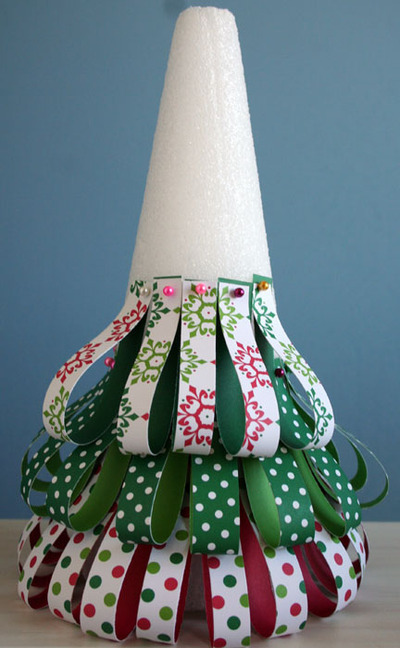 The finished tree is 11" tall and 7" in diameter. Your paper really needs to be doublesided. My Pebbles paper is not, but all the American Crafts Paper is.